Youness, an ageing taxi driver, takes a young woman to the hospital at the end of his work day, not knowing what awaits him there. In this simple story, Iranian filmmaker Reza Mirkarimi offers a narration about people who help others, people they don’t know, and who remain anonymous once help has been rendered; an anonymity that also exists for the film’s audience. This dimension is built on a minimum of dialogue, as speech is often a source of misunderstanding. Will this taxi driver in the huge city of Tehran be able to remain silent when confronted by all the slings and arrows of an exasperated society? Will he be able to take a pretty little flower into his world of solitude? 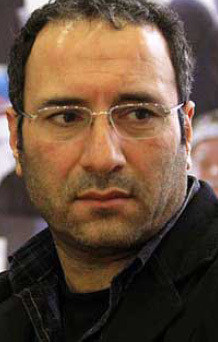 Reza Mirkarimi was born in Tehran, Iran, in 1966. He graduated from Tehran Fine Arts University with a degree in Graphic Arts. His filmmaking activities began in 1987 with a short film named For Him. He also developed his own television series, The Adventures of Mrs. Aziz and Hemmat School Kids. He has made two documentaries about sports, From Football to Football and The Champions of Wrestling for TV networks. His first feature film was called The Child and the Soldier (1999). This film brought him several local and international awards: the Golden Butterfly award of Isfahan in 1999, the Silver Balloon from the Trois Continents Festival of Nantes in 2000 and the Golden Shoe from the 2001Film Festival for Children and Youth of Zlin (Czech Republic). In 2012, Mirkarimi took part in the Cines del Sur Official Section with A Cube of Sugar. Today is his most recent film. Filmography: For Him, 1987; Koudak va sarbaz (The Child and Soldier) 1999; Zir-e noor-e maah (Under the Moonlight) 2001; Inja cheraghi roshan ast (Here, a Shining Light) 2003; Kheili dour, kheili nazdik (So Close, So Far) 2005; Be hamin sadegi (As Simple as That) 2007; Ye habbeh ghand (A Cube of Sugar) 2011; Emrouz (Today) 2014.